Having weathered the storms of the past two years can we look forward to the calm waters ahead. Capital is a coward. At the first sign of trouble (everyone calls it “uncertainty” these days) it bolts for the door. It’s what the majority of the media and politicians warned us would happen if Trump won. It sounded plausible and all appeared to be going to their script in the small hours of last Wednesday morning when it became apparent that Trump’s victory was nailed on. But the markets weren’t having it. The US electorate have spoken and the world is a more volatile place this morning. Is it the dawn of Mad Max... or simply the dawn of a new era in politics? For the second time in 2016, and after the shock of the Brexit vote, an electorate has overturned the establishment and made it clear (well by a simple majority) that the road ahead needs to be considered differently. It lay ultimately with the state of Florida to give the Free World its new leader – who would have thought that? This time last year, the UK’s stock market was at a similar level to today and pretty much where it had been sitting calmly for over a year. International bond and currency markets were relatively sanguine; all playing along nicely to the script written by the US Federal Reserve. Improving economic data, supportive central banks and some temporary relief from eurozone woes, courtesy of the sacrosanct European Commission holidays, added to the general feeling of a classic stock market summer daze. We received news yesterday of the suspension of trading in the M&G Property and the Standard Life Ignis UK Property funds. The managers of both of these funds have taken the decision to close, or “gate”, the funds in order to stop redemptions depleting the cash in the funds to a point where they would become forced sellers of property assets; the real bricks and mortar properties in which they are invested around the UK. They say economists add a decimal point to show they have a sense of humour and so maybe they had a hand in the UK Chancellor of the Exchequer, George Osborne’s forecast that, within two years, the UK would face a recession and a minus 3.6% contraction in GDP. Given this precision, it’s surprising that the figure has already been withdrawn, along with Project Fear, and that we should instead raise our eyes to the sunlit uplands befitting the world’s fifth largest economy. It’s often the case that some of the most thought provoking comments come from unexpected sources. It was actually the director of bonds at Rathbones, who also sits on the Bank of England’s Debt Management Office consultation committee, who reminded me the other day of the simple fact that in every year since the Global Financial Crisis (GFC) of 2008, the FTSE 100 Index has fallen once at least 10%. That’s a sobering thought but closer examination of the data is more unsettling. From 2008 to 2011, there were losses during the year of between minus -17% and minus -33%. Obviously, the FTSE recovered from each of these sell-offs, but few who lived and invested through them, ourselves included, were sanguine about the falls at the time. Following our ‘Brexit’ note last week comes ‘Bremain’; the UK voting to remain in the EU. The referendum is clearly taking on even more global significance with it now cited as a swing factor in the Federal Reserve’s decision to raise US interest rates at their next meeting. With this in mind I thought you would be interested in the Bremain note penned by our UK desk yesterday. As the UK’s European Union referendum approaches we are often asked do we think the vote will be ‘Yes’ to remain part of the EU or ‘No’ it should leave? The year started with a number of new statistical records, not least of which was the US stock market suffering its worst start to the year since 2001. Of course, as is almost always the case in today’s globalised world, the concerns stretched further afield and, in this case, China was held up as the culprit with their central bank being accused of indulging in the new cold war of currency manipulation. Coming so soon after the admission of the Renminbi to the global SDR basket of trading currencies, this was an unsettling time for stock and bond markets and the Chinese authorities PR machine seemed to have trouble conveying their various reassurances to nervous markets. With 2015 and 2016 leaving nowhere to hide for fund managers accused of being index trackers, and following on from my recent missive on the failures of index trackers in today’s market environment, one hopes that clients are quickly wising up to what they are paying for, and what that service truly represents. Index trackers have their place as I mused previously, but after the recent research on construction of portfolios was presented by Lang Cat Consultancy and CWC Research and featured in Investment Week last month, one might be forgiven for thinking that if you are not tracking the market, then you are tracking everyone else! The research paper postulates that Discretionary Fund Managers all herd to the same funds, thus is there really any difference between one manager and another? The comments and funds below were highlighted by Lang Cat Consultancy and CWC Research as being representative of DFM portfolios. They claim that DFM portfolios are becoming increasingly concentrated, with the most popular underlying funds used in 15%-20% of vehicles. Indeed they remarked, “There are very few DFM portfolios across the sample which can claim to have a 'unique' or 'individual' proposition and keep a straight face”. TAM is pleased to dispel the myth that we are all alike and we can (sort of) keep a straight face! In our core portfolios, we do not have a single fund represented in this list, although our ethical and high income subsets do have one very small holding! Bertrand Russell, aristocrat philosopher, once famously quoted, “Collective fear stimulates a herd instinct and tends to produce ferocity toward those who are not regarded as members of the herd”. It’s therefore no surprise to find that Discretionary Fund Managers, in times of market stress as witnessed recently (or even when no fear pertains? ), seem to flock toward the same/similar funds. Why wouldn't they - they are the best! How does this happen then? Regrettably, the availability of statistical and performance analysis (bearing in mind, fund managers tend to all use the same rating systems) is now so easily available to all, it’s not surprising that ‘free thinking’ - within the confines of risk managing a portfolio - is not unanimously encouraged. After all, it’s safer being with the herd… isn't it? TAM’s investment strategies are built for the client and, one hopes, not bound by constraints on free thinking. Finding the right mix of opportunity and adventure, along with safety, security and diversification - all within the confines of our clients’ risk parameters - governs how we approach fund selection and our market allocations. It’s not always just about the numbers. It’s this strategy that continues to use a strong core research capability with a free thinking override. This consideration of capital preservation, balanced with capital generation across diversified asset classes, has enabled TAM to perform well - relative to its risk-graded benchmarks and the market over the long term. 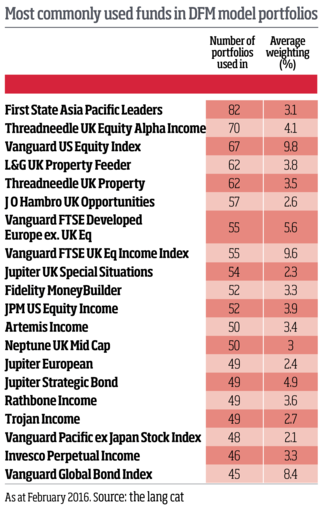 This is all without holding a SINGLE fund classified as being in the top 20 most held funds in its core DFM portfolios, according to the recent study by Lang Cat Consultancy and CWC research. It is therefore possible, contrary to market expectation, to be alternative or ‘different’ in a space in investments where most think that alternative portfolio construction doesn't exist, or cannot perform if it did. That’s not to say we would not find value in these funds highlighted herein, either now or in the future. One might deduce that TAM’s investment team, who are on the street kicking tyres as much as they are desk-bound, are questioning the norms and bucking the fund trends. Otherwise, we would hold what everyone else seems to be holding, wouldn't we? TAM’s ability to break away from the herd in search of value, without losing sight of the risk-defined goals, makes our offering worthy of note in today’s highly competitive market place. This, I believe, highlights one area of what TAM is doing to add value to its investment offering. 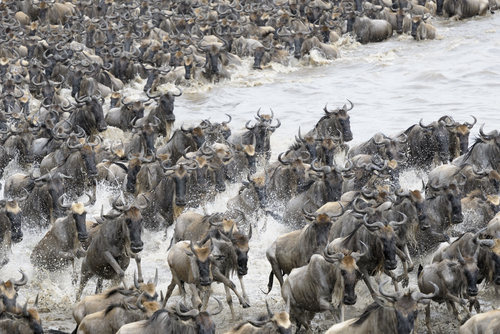 TAM are not the norm… No wildebeest here! It seems scarcely believable now but after the Federal Reserve finally raised interest rates back in December, following years of speculation about the timing of the hike, we now have more central banks than ever running a negative interest rate policy, or “NIRP”. This is unsettling for a number of reasons. First and foremost, as an experiment, this has never been tried by central banks before and opinions on the consequences range from a welcome return to normality to the chaos of an end of the financial world as we know it. Whilst we have not entered either of these endgame scenarios, the adoption of negative rates at this stage of the game has thrown into doubt whether the US economy, and indeed the rest of the world, was strong enough to take a 0.25% raise in the first place. The Fed evidently thought so. Stock and bond markets are not so sure. When the acronym “ZIRP”, meaning zero interest rate policy, first started doing the rounds, the expression itself seemed to imply that ZIRP was the end of the road. A finite monetary policy destination of nought. Some readers may remember our Ferrari number plated with “ZIRP 4EVA” – and that was December 2013! However, although the Fed is moving in the opposite direction we’re now coming to terms with NIRP. It started small. Sweden was the first central bank to introduce negative rates in July 2009 in the wake of the Great Financial Crisis (GFC). Switzerland followed in December 2014 in an attempt to stave off the safe haven strength of the Swiss Franc. Denmark is also there with negative rates. But the big one is the eurozone where the 19 countries enjoy a deposit rate of minus -0.3% since December. The latest joiner to the club is the Bank of Japan who caught the market off guard by reducing interest rates to minus -0.1%. And it’s not just base rates. Japanese 10-year bond yields have been flirting with negative rates all last week. Make no mistake, we are into new unchartered territory and to many it is a confusing concept for both seasoned market players as well as the man on the street. One ambition common to all the main central banks that have implemented the emergency measure of ZIRP or NIRP is to raise inflation from its current malaise to somewhere around 2%. This fits with the commonly accepted view that price stability is part of a central banks responsibility and that inflation is as reasonable a gauge of price volatility as anything else. The concept of adopting inflation targeting was first adopted by New Zealand in the 1990’s with the Bank of England following two years later. We had to wait until early 2012 for the Federal Reserve to adopt something similar under the then Chairman, Ben Bernanke. Inflation fell markedly from over 2% into negative territory but has recently rebounded in the last couple of months. Yellen (and probably Kuroda, Draghi or Carney) would be quick to point to this as evidence that QE is working. Even the more benign core inflation has moved north of 2%. However, whilst the direction of travel is indeed positive, these are very low levels of inflation in response to the amount of money that has effectively been printed and considering interest rates are either negative or close to zero. We have asked before whether it is possible that low interest rates are actually CAUSING low inflation? From the perspective of a saver, if you had £50,000 deposited in a bank yielding virtually nothing, what would be your propensity to go out and buy a new car if the prices of new cars had gone up? You could borrow the money from a bank at low rates (if they’ll lend it) because you think that lashing out now is better in case prices keep rising. But if your confidence was low due to bad headlines on the economy, you might decide to stick with the car you have. In this theory of a non-inflationary world, car dealerships intrinsically know that you have no more money from interest than you did the year before and, therefore, do not raise the sticker price. Again, generalising to make the point, lowflation (we can say lowflation – it’s in online dictionaries; it might make Oxford English Dictionary one day) that lasts for 10-15 years can change the mentality of the average worker. A whole generation of Japanese workers have never experienced inflation. In Tokyo, you can see the minimum fare etched into the rear windows of taxis and the prices of staples never seems to change. This same generation rarely seek a pay rise and, ultimately, one can see how it could lead to the demise of unions with nothing to agitate for. Gurus or broken clocks that tell the right time twice a day? If this scenario is quietly being played out, the wait for higher inflation and growth will be a long one. Some of the most famous investors on earth have a major problem with this. Jim Rogers, as well as being a well-known investor and TV market pundit (and a major in history) has, in addition to motor biking around the world, set a world record for his 3-year drive through 111 countries in a converted Mercedes SLK. Of the wisdom of central bankers, he recently said on CNN TV, "They think they are smarter than the market, they are not! We are all going to get hurt by a global recession”. He added "We're all going to pay a horrible price for the incompetence of these central bankers," and went on to say "This is going to be a disaster in the end, you should be very worried and you should be prepared." He did hedge himself by predicting that all of the unconventional monetary policy will lead to a stock market rally in the near future and, as we follow these things at TAM, he was bearish on the US dollar from 2008 until 2015 during a period of extraordinary strength only to turn bullish in April 2015 just as it peaked out. Still, it makes for entertaining TV. Maria Bartiromo: You don't know that I don't own any gold….. actually, you're right, I don't own any gold. Okay, guilty as charged, I don't own any gold. I first met Mark Faber personally in 2004. He held gold then and still holds gold now. Goldman Sachs thinks we should short it. Go figure. But I remember we at TAM wrote about gold during a particularly gloomy January 2012 when a gold ATM machine made an appearance at Westfield shopping centre. We cautioned against owning it at all, even as a diversifier. Happily it lost 40% in US dollar terms in the 4 years to the end of December 2015. Bill Gross set up a small bond fund after co-founding PIMCO in 1971 at the start of one of the most extraordinary bull markets of all time. His firm amassed $2 trillion of global funds running one of the best performing funds in its class giving an annualised total return of 10% over 30 years. "They all seem to believe that there is an interest rate SO LOW that resultant financial market wealth will ultimately spill over into the real economy. ... How successful have they been so far? Why after several decades of zero percent rates has the Japanese economy failed to respond? Why has the U.S. only averaged 2 percent real growth since the end of the Great Recession?" It’s a great question and we share his concern that investors remain vigilant. But Bill Gross has been calling time on bond markets for some time. In 2010 he declared that the UK’s bond market was like a bed of nitroglycerin, ready to go off the moment the Bank of England was forced to raise rates. He reiterated his bearish stance again in 2013, since which time, US and UK, bonds have moved higher still. That’s not to say we don’t share his view of government bonds now, it’s hard to disagree with much of it. a. We believe that government bonds are now very expensive and, far from representing “risk free return”, they offer not much more than “return free risk”. TAM client portfolios now have a far lower exposure to bonds and Government debt than anytime in the past. b. Stock markets are now trading mid-range between last year’s highs and this year’s lows when the sell-off failed to budge the Federal Reserve’s resolve to consider scaling back their schedule of future rate hikes. This has happened several times in the last few years. We have kept only a mild overweight in equities and, even then, almost entirely in very specific themes with a small exposure to ETFs which we use for shorter term investing which this kind of market demands. Whether the investment gurus are right or wrong, it seems to us that the central banks are in no mood to be pushed around and it is still them in the driving seat. They are both universally challenged. It would be easy to convince anyone that 2016 is going to be more difficult than last year. The list of dreads threatening to derail stock and bond markets is pretty much the same as before but we are at least closer to understanding the end game of the post 2008 “Great Financial Crisis” as the US Federal Reserve start what they believe to be a year of interest rate hikes. The economic backdrop is more challenging than a year ago and more difficult to predict. In recent years, we have grown used to the intervention of central banks and governments who have played a hand in the direction of stock, bond and currency markets around the world. But diverging policy between the US, UK and the rest of the world complicates the investment landscape. However, we have found, and continue to ﬁnd, investment opportunities despite the rather bleak outlook. Indeed, all of the TAM Premier risk portfolios made absolute gains of between 1.8% to 5.7% despite benchmarks down around 2.5%. Broadly this was due to a combination of good judgement and fortune by having invested in the right asset classes as well as the right investments. TAM clients beneﬁtted from strategic and well timed investments in Europe and Japan and the economic recovery in the UK was particularly good for the UK equity investments which had a more domestic bias as opposed to the large international household names that dominate the FTSE 100 index of Britain’s leading companies. But it was also a good year to avoid obvious pitfalls that ETF and “passive” funds, by their very nature, do not. We were underweight Gilts and other sovereign government bonds, which hardly moved, and client portfolio exposure to plunging commodities and emerging markets was very limited. We also bought various investments at times of market distress where we saw that the opportunity outweighed the risk. We believe that a similar strategy will yield positive results in 2016. In a world of low and slowing growth, and low returns, this is the only strategy which we believe holds out the prospect of beating inﬂation and cash in the bank. On that note, we recognise the investment world is fraught with danger and prone to setbacks from any number of geopolitical events. Some are important, many are not. And, as we saw in 2015, some headline issues barely made the footnotes by year end. For a number of reasons, the right investment approach has changed since the turnaround in the Spring of 2009. The rise in the use of passive or index tracking funds has often contributed to rising volatility when events force a market reaction. We have become used to signiﬁcant indiscriminate sell offs that punish all stocks regardless of their merits. The ﬂipside of this represents opportunity for those who believe they know when things are oversold. Navigating this mineﬁeld requires a combination of making the right decisions for the long term whilst being cognisant of the short term opportunities to either buy or sell, whatever the asset class. We lay out our thoughts below on the various regions and asset classes that were central to the plot last year and look set to determine 2016. With an election set early in 2015, Greece’s problems loomed large in the minds of investors as the risk of policy error could’ve seen Greece out of the Euro, a renewal of the eurozone crisis and the risk of contagion spreading to other peripheral eurozone states. However, compromises were reached between the Greek government and eurozone creditors, leaving the ﬁeld open for the ECB’s quantitative easing program to have the desired effect. As we said in late 2014, the wait for some kind of stimulus had been hanging in the air for the best part of 2 years, but the collapse of inﬂation to near zero started to make a mockery of the ECB’s 2% inﬂation target and the weight of expectation from the markets to act was overwhelming. The ﬁnal €1.1 trillion package was bigger than markets had hoped for, given the opposition from the German Bundesbank, and the prospect of €60 billion per month of bond buying for 18 months saw bond yields and the Euro fall to the lowest level for several years. Eurozone equities obligingly raced up to new multi-year highs. Of course, by year end and with eurozone inﬂation still stagnating and growth ﬂagging, Draghi was force to act again and expand the program further. Unfortunately, markets didn’t take his vague forward guidance, and handling of the situation, quite so enthusiastically and a bout of proﬁt-taking brought the main European markets back to close to where they started the year which seemed to capture the mood perfectly. But where’s the after party? As we predicted last year, most of the fears on Europe’s list of dreads came to nothing. French, Spanish and Italian politics were interesting but largely ignored. Warnings over the conﬂict in Ukraine and Russian sanctions were easily passed by and even Greece faded from the headlines despite serious domestic problems being evident to those who continued to follow events there. Of greater concern is the threat from deﬂation and a lack of economic growth. The eurozone is in a 7-year depression and output has still not recovered to the peak reached in 2008. The unemployment statistics beggar belief, particularly amongst the young (50% in Greece, 40% in Spain and Italy and 25% in France). However, this has long been known and it is the direction of travel for these various factors that is crucial for stock and bond markets. Mario Draghi tells us that he believes that QE is working and, on the face of it, he is right if he means that things are either stabilising or improving. Certainly, the availability of credit has risen as a direct result of QE. So we look at both the broader eurozone/EU economy and the markets with a mildly positive yet cautious eye. Europe ex-UK is not, in our view, set to be a rising tide that lifts all boats. In order to proﬁt from the excellent opportunities on offer, we have approached investment in European equities with a selective stock-picking approach which can seek out overlooked and oversold quality investment opportunities whilst having the ﬂexibility to avoid areas of obvious danger. In their last act of 2015, the Federal Reserve ﬁnally bit the bullet and raised interest rates by 0.25%, to 0.5%. It was hard to get too excited. Relief would be a better description of the market reaction. Memories of last year’s ﬂip-ﬂopping episode was still relatively fresh in the minds of bond market investors, and when the Fed included China as yet another reason for keeping rates on hold in September, there was an outside chance that it could be cited again. But another pass would’ve sent a terrible signal that all is not right with the economy or, worse, that the Federal Reserve knew something bad that we, the market, did not. After all, if the mighty US economy couldn’t handle a quarter point hike, then we were all in much more trouble than we thought. However, bond markets got to the point that a hike was all but a given and, when it was ﬁnally announced, stocks and bonds took the news in their stride. This wasn’t surprising since there hadn’t been, in our view, a whole lot of fundamental investment going on in the weeks leading up to it. Indeed, as if lending credence to the notion that markets can only think about one thing at a time, the falling price of oil preoccupied markets in the days following the hike. Of course, the collapse in the price of oil feeds into inﬂation data which, in turn, affects the bond market. Even core inﬂation ﬁgures, which strip out fuel, fall as the cost of production and transportation of goods comes down. Since the precipitous fall in the price of crude happened in the October/November 2014 period, there had been some expectation that, mathematically, year-on-year inﬂation might start rising again due to the base effect. That was until Saudi Arabia decided at the OPEC meeting to keep pumping and crude fell again – lowering both inﬂation forecasts and, therefore, interest rate expectations. One rather unsettling assertion gathering momentum into the fourth quarter was that the Federal Reserve was as data dependent as the rest of us mere mortals when deciding the timing of a rate hike. There was nothing in the central bank forward guidance that told markets what they did not already know. In addition, almost all the economic indicators were ﬂashing green with the obvious exception of inﬂation, which left everyone hanging on the last piece of the puzzle: employment and the monthly non-farm payrolls. What was clear, however, was that Fed Chair, Janet Yellen, wanted to see a favourable reaction from the stock market as a sign of affirmation and success. To this end the state of the economy was talked up and the stated intention of higher rates spun as a lifting of emergency measures and a return to some kind of normality. It’s an attractive scenario and hard to argue that it wouldn’t be a whole lot healthier than zero interest rates forever. Indeed, part of our thinking on very low interest rates is that they are indirectly to blame, and the cause of, low inﬂation. They say “Don’t ﬁght the Fed”, and we hope they’re right, but their forecasts of another 0.25% per quarter for a full 1% rise by the end of 2016 seem, to us, overly bullish. For now, the bond markets appear to agree with us although we are keeping a close eye on Q1 because, unlike the 3 previous years, the USA is experiencing a very mild winter. Construction is well up on previous years and could contribute to a mini-boom which would vindicate the current Fed outlook. Indeed, if both economic activity and corporate earnings are much stronger than previous years, the Fed could appear “behind the curve” prompting a signiﬁcant stock and bond market reaction. A majority win for the Conservatives ended the previous coalition and the stock market enjoyed a short lived honey-moon period as a result. But talk of interest rate hikes was already in the air owing to the economic recovery already underway in the US and UK and the prospect a ﬁrmer approach to austerity to balance the economy was evident in the weeks that followed. It was always going to be difficult for Bank of England Governor, Mark Carney, to convince us that the independent Bank would and could get in front of the Federal Reserve and raise rates if the UK economic data justiﬁed it. There were few who doubted that it was going to follow the Fed. So at times the situation was rather awkward and, whether Mr. Carney believed it himself, he did open himself up to accusations that he was blowing hot and cold on economic pronouncements and often reining in previously bullish talk lest it looked like he was getting ahead of events. MP for Wolverhampton South East, and Treasury committee member, Pat McFadden, even likened him to an “unreliable boyfriend”. UK plc is doing rather well and the economy remains in reasonable shape with modest economic growth accompanied by low inﬂation. UK GDP for the third quarter came in slightly worse than expected at 0.4% and the Office for National Statistics forecast a lower annualised ﬁgure of 2.1% to take into account an anticipated slowdown in the ﬁnancial sector. However, we remain upbeat about the prospects for equities throughout 2015. There was very little progress in the main stock market index. The FTSE100 Index was down nearly -5% due mainly to the heavy weighting in oil and mining companies exposed the slowing Chinese economy. However, the UK exposure in TAM portfolios had a more domestic UK bias which favoured small and medium sized companies less exposed to international volatility in currencies and slowing global growth generally. We expect to stay with this as a core strategy into 2016 but have recently taken a view that the energy and mining sectors are starting to look oversold in the short term. Where appropriate, we have added to UK equities with investments that will perform should our rather more positive view of the economy and investment landscape prevail. It is early days in the Brexit debate but it is apparent that investors here and abroad are waking up the possibility of an exit from the EU and its ramiﬁcations. It would appear that polling, if anyone still trusts them, is broadly balanced between getting out or staying in. For the moment, the focus is on the new deal Prime Minister David Cameron is trying to achieve with EU partners. Expectations here are already very low and a cynic would assert that he is pretending to get a better deal whilst the EU pretend to listen. The Conservative party has a natural split on the issue which Cameron has, for the moment, allowed to run, presumably in the hope that he can come back from Europe with a deal that convinces the British voters to stay in. However, the out campaign appears to be off to a better start, helped by issues on immigration and welfare already ﬁlling the national media. There is every chance that a failure to secure any material changes to the UKs relationship with the EU to lead to Cameron kicking a referendum into 2017. But in the meantime the uncertainty, which markets hate more than anything, has been one element putting downward pressure on Sterling which ﬁnished the year at $1.48, down 7.5% from the peak in the summer. Whilst we have maintained some modest exposure to Asia ex-Japan, our main strategic investment was in Japan itself. The program of reform, known as Abenomics, has been around a while and been prone to setbacks. As we have said throughout, the ﬁrst two of the “three arrows” policy was relatively straight forward to implement, namely monetary and ﬁscal policy. The third of corporate reform is far more complicated. However, as we wrote earlier in the year, we believe the best way to invest in Japan has shifted from re-ﬂation to investing in the companies most likely to beneﬁt from an unprecedented co-operation between the Bank of Japan, the government and the big global corporates of Japan’s leading companies. While concerns over China linger, it can be a hostile environment for stocks anywhere in Asia and Japan in particular. However, we believe that Japan, governmental, corporate and central bank, have no option but to align their interests in a determined effort to dig Japan out of two lost decades of deﬂation. We believe we have invested in the right strategy and that there is, from an opportunity perspective, much to justify being invested here against the risk of being out altogether. Emerging Markets - Could the EM Buyer Strike Back? Despite government assurances to the contrary that emerging markets are in better shape than in the aftermath of the 1998 Asian currency crisis, foreign investors withdrew money from emerging market funds at a record rate. This is an area that we have been well to be out of but we are conscious that opportunities are starting to present themselves. We have grown used to talking about Emerging Markets as a group, such as BRICS: Brazil, Russia, India, China. Other markets enlarge the basket further and many have eliminated themselves as being investible due to over exposure to commodities or rising nationalism, or a combination of both, such as Brazil or Russia. India and Mexico have been relative success stories but this story is well played out and, generally speaking, these countries are no longer cheap. China is the biggest of all the EM group and affect Asia and Japan as well as the rest of the world. For now, US dollar strength, appears to undermine the case for investing in emerging markets but we may, as the year unfolds, revisit this area because the opportunity could justify the risk. As we noted in our outlook note for 2015, the year ahead was summed up in a list of concerns as long as your arm ranging from ebola and Italian politics to the Chinese property bubble and the falling price of oil. We dismissed most of them as not being materially important to stock and bond markets and chose, correctly as it turned out, to focus on the likely impact of the prospect of a stronger US dollar on the back of rising interest rates, eurozone deﬂation and China. It is true that both stocks and bonds appeared relatively expensive against recent history and, for the most part, we remained close to benchmark weight in equities whilst staying with alternatives to bonds, such as property. However, noting the low volume and value of shares being traded on a daily basis, we expected that markets would be vulnerable to bad headlines with volatility being an inevitable consequence. In this regard, we have exercised our stated strategy of taking advantage of oversold situations in bonds, equities and currencies and have invested where we believe the opportunities outweigh the risks. These opportunities arose principally out of the so-called “Black Monday” sell off in August which came about from slower than expected growth in the Chinese economy and the Chinese central bank’s action to weaken their own currency. In essence, this news should not have come as a surprise to anyone but such was the fragility of market sentiment that the resulting sell-off was bigger than many expected. The reality of an actual 0.25% rate hike from the Fed in December has taken some of the short term speculation out of markets for now although one expects that the interminable “will-they-won’t-they” media commentary to come back to haunt us every couple of months throughout 2016. On the face of it, we believe the Federal Reserve’s forecast that rates will rise by a full percentage point per year until it reaches 3.25% in 2018, to be overly bullish and overestimates the rate at which the US economy can recover. For the moment, bond markets appear to indicate a level of scepticism which matches our own and we may moderate our underweight stance on bonds as the year unfolds. In Europe, where company earnings growth appears to be outpacing that of even the USA, we continue to stay invested in selected eurozone equities and have, for now, removed the hedge against the prospect of a weaker Euro despite the prospects for accommodative loose monetary policy from the ECB for some time to come. However, whilst we believe investment here is justiﬁed, we are awake to the political risks in the eurozone, including the UK referendum, as well as the structural risks to the EU which are compounded by unilateral changes to Schengen among member states and growing gulf between north and south, east and west and Euro vs non-Euro states. Of course, the loosening of monetary policy in the eurozone is not unique. The Bank of Japan has undertaken a truly enormous QE program of their own in order to weaken the Yen and have a chance of reﬂating their economy once and for all. TAM client portfolios had already beneﬁtted very well from their Japanese exposure but with the ambitions of the Bank of Japan and Government being so unambiguous, we decided to have some degree of hedging on the Yen as well. This could well be our mantra for 2016. In the same way that a year ago we expected little from bonds and equities from the main stock market indexes, we were conﬁdent that a stock picking approach would yield a modest return above inﬂation. Broadly speaking, we can cite many of the same reasons for a similar outlook in 2016. The US economy continues to grow and falling unemployment, with some wage growth, paints a positive picture. However, for a couple of years now, company proﬁt margins have been running at record levels as companies cut costs to cope with ﬂat sales growth. This is impressive but something that only gets harder to repeat, particularly in the face of a pick up in wage growth which has been stagnant since the ﬁnancial crisis in 2008. We expect to keep investments in very selective themes where we are pursuing a specific strategy while maintaining only a mild overweight to equities where appropriate. This strategy has worked well throughout 2015 and we continue to provide above benchmark returns across all risk profiles with lower volatility than the related benchmarks. It’s a good week for top drawer statistics and there are so many, it’s hard to know where to start. The Dollar has been on a tear hitting a 5 ½ year high against Sterling. Oil is heading towards a 12 year low. The Eurostoxx 600 Index has had its worst week in four years. The FTSE has posted its worst first week since the year 2000. The Japanese stock market has had its worst opening week since 1949. And trumping them all, the New York’s S&P500 has put in the worst 5-day start to the year…ever. All very interesting, but to put some perspective on the moves, and because things are changing so fast, the one month falls to 12th January are as follows: China -13%, Japan -7.9%, USA -4.8%, Europe -3.5%, UK –0.0%. The zero performance of the UK stands out as being almost respectable but one has to bear in mind that the FTSE 100 Index already received a thumping back in September owing to the index’s heavy weighting in oil and mining shares which fell sharply when fears over China’s slowing economy resurfaced. China is, of course, the main culprit for the current sell off now that concerns have widened to include not just manufacturing data but the falling Yuan currency and a complete lack of response from the Chinese authorities. In a sense, not much has changed. On the face of it, the official Chinese economic data still looks reasonably OK. The problem is that nobody believes many of the economic statistics issued by the Chinese authorities and hasn’t done for some time. The lack of credibility on GDP growth, for example, has made it increasingly difficult to get a handle on what is going on at a time when China is trying to manage a transition from an all-out industrial manufacturing economy to one with a far bigger services sector. Furthermore, the US Dollar has strengthened appreciably since cracks appeared in China and other emerging markets back in September. This has put additional pressure on already struggling emerging market stocks which have built up large US Dollar debt piles but are losing the power to raise earnings domestically to offset the damage. In the absence of a genuine recovery in the Chinese economy, which was great for emerging economies during the consumption boom in commodities, the likelihood of countries like Brazil, Russia and South Africa slipping from recession into outright depression has understandably increased. There is an optimistic view that troubles in China can be contained because they have, among other things, a closed capital account which limits contagion to the developed economies. Indeed, the fall in the price of commodities, notably oil, should be good news because it puts more money in the pockets of western consumers. As long as the US economy carried on growing, these sorts of arguments made it easier to overlook the dangers posed by the difficulties facing China which has grown to be the world’s second largest economy. The problem now is that whilst the US is still growing, the rate of growth has slowed more sharply than expected. Combined with the Federal Reserve now hiking rates after having kept them on hold for 7 years, the increasingly uncertain outlook has raised fears of policy error in an already difficult to read. Yesterday's headlines included a comment from the Royal Bank of Scotland credit team advising their clients to “sell everything” except high quality bonds. This is a big call, and potentially a bad one. For a start, bonds, generally, yield very little for the risk that they carry, in our view. Also, policy risk can also swing the other way. If the Chinese authorities suddenly decide to unleash their own QE to deal with their principal problem of too much debt, being out of the equity markets could be a costly mistake. Events are moving quickly but we note that the large swings in the global stock markets this week are on quite low volume and having, we believe, an exaggerated effect which is unlikely to last. We will shortly be putting out our longer term view of 2016 in our next note but want to assure TAM clients that the diversified strategy that characterises all portfolio mandates, has stood the test well in previous years and we expect to weather this period of volatility with confidence that we will exploit any opportunities that arise.